Stretchable electronic devices are made up of an electrical circuit that may include wires and resistors, which are used to control the flow of electric current. This circuit, often made up of metal oxide materials, sits on top of a stretchable base called a substrate. 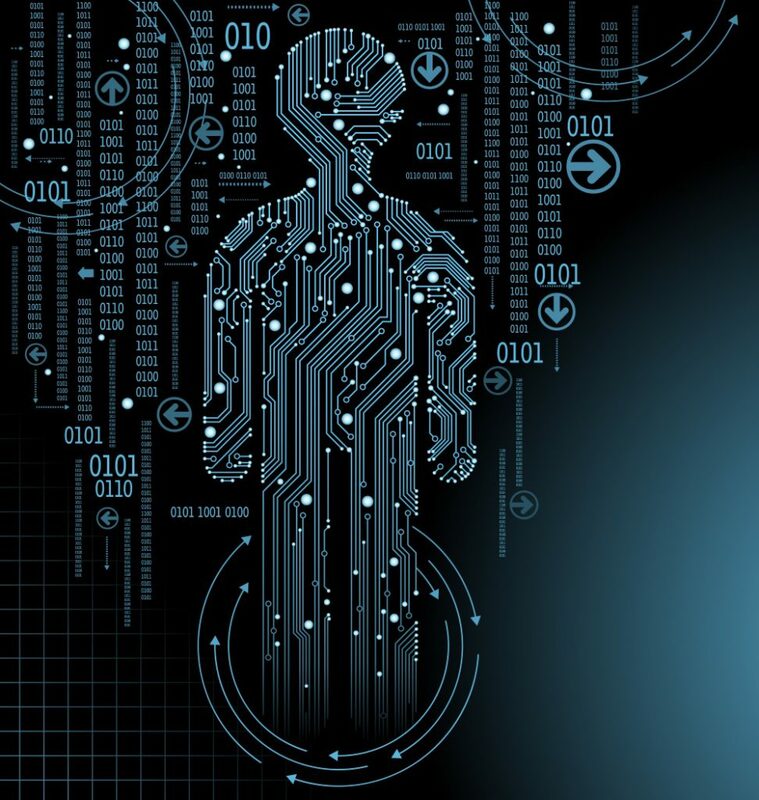 Such devices are becoming increasingly relevant in medical fields, as their flexibility means that they can be worn by people, either against the skin or on clothes. Opto-electronic sensors are one important type of stretchable electronic devices, as they can be used to monitor certain physiological parameters. Typically, these devices either detect light (usually visible light or ultraviolet) or manipulate the light that falls on them. 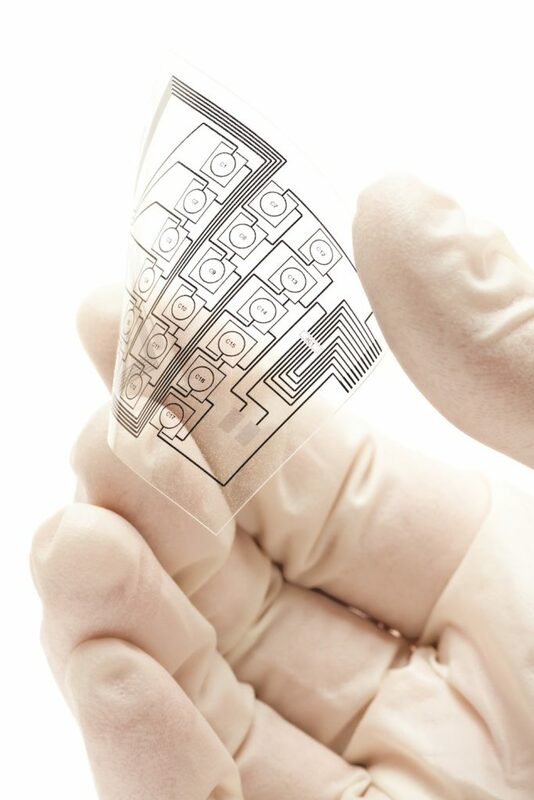 As well as being stretchable, opto-electronic sensors also need to be transparent, so that light can pass through the substrate material and be sensed by the active layer of material (usually a metal oxide) within the device. These sensors are capable of measuring the body’s physiology directly (for example blood pressure, heart rate and body temperature), and can produce data that needs to be processed, stored and displayed – all of which may need to be carried out on the body. Currently, many sensors designed to be worn by people, either as a skin patch or on clothing, are made using rigid materials. For example, hard plastics, copper wires and battery power supplies are often used, which are bulky and may perform poorly when subjected to the stresses and strains of everyday living. Dr Madhu Bhaskaran and her group at the RMIT University aimed to create transparent stretchable electronic devices that could perform accurately and repeatedly. One of the significant challenges for conformal wearable sensors and other devices worn on the body is the constant stretching and straining that they would experience as someone goes about their daily life. 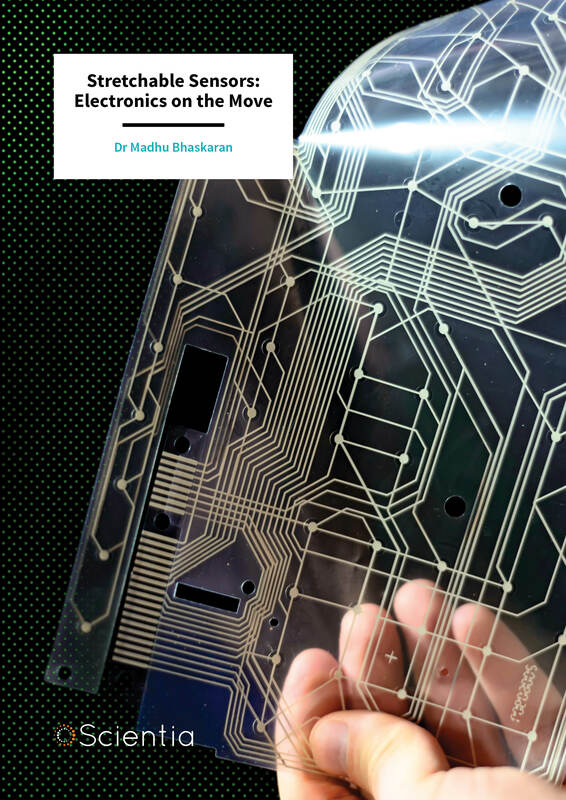 ‘With the demand for stretchable electronics, the challenge remains in the integration of functional metal oxides with polymer stretchable plastics as we see in new bank notes,’ says Dr Bhaskaran. 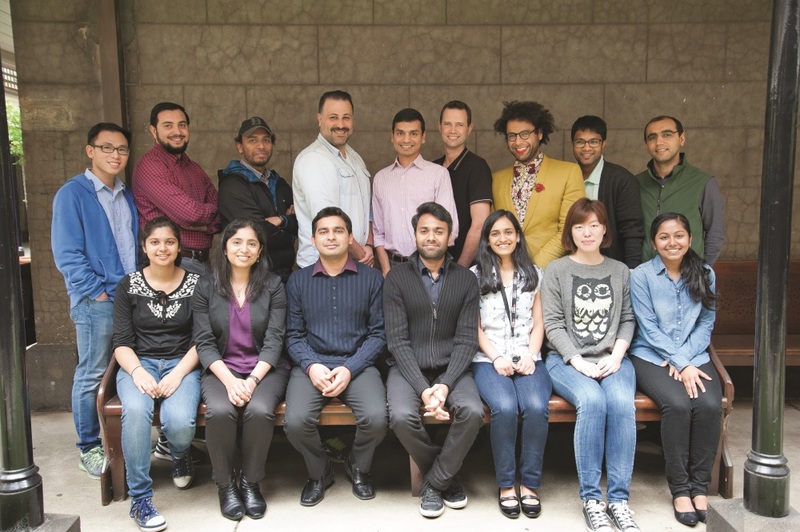 When designing their devices, Dr Bhaskaran’s team chose a material called polydimethylsiloxane (PDMS) as a substrate, which is stretchable, transparent and non-toxic. PDMS has previously been shown to be biocompatible, and has been used in contact lenses, skin and hair products, and even as a foaming agent in some foods. The team used a thin film of a metal oxide, either indium tin oxide (ITO) or zinc oxide (ZnO) or titanium dioxide (TiO2), as the functional part of the device. These metal oxide films need to be heated to over 400°C, in order to make them functional – however, PDMS can only be processed at temperatures below 100°C. To address this problem, the researchers developed a novel method. ‘My team has innovatively created a technological breakthrough by overcoming an engineering challenge of combining diverse materials to realise practical, wearable sensors,’ says Dr Bhaskaran. The team first deposited a layer of ITO on a thin layer of platinum on a silicon wafer, and then heated it to 400°C to make the material transparent. After this heating process, they coated the ITO with PDMS, and embedded metal oxide resistors within this stretchable PDMS base. The platinum layer does not adhere well to the silicon wafer base, which means the PDMS and metal oxide layer, together with the platinum, can be easily peeled off the base. The team then removed the platinum layer by placing the device in chamber of gas where ions actively remove the platinum, leaving only the stretchable electronic device. Dr Bhaskaran and her team then went on to test their new ITO devices. They put the devices under strain by repeated stretching, measured their transparency and visualised their surfaces using a microscope with an extremely high magnification, called a scanning electron microscope. The team found that their devices were highly transparent, as they allowed 60–80% visible light to pass through. As mentioned previously, metal oxide materials such as ITO and ZnO are typically rigid, and this has prevented them from realising their full potential in wearable devices. Amazingly, under mechanical strain (by stretching the material repeatedly), the team’s devices performed well and showed only a slight change in their electrical properties. So, how does a brittle material like ITO maintain its functionality under strain? To answer this question, the group decided to take a close look at the microscopic structure of the metal oxide surface. Using their scanning electron microscope, they took pictures of the surface under various degrees of strain. What they found was amazing. The images they obtained showed that the ITO surface was made up of tiny plate-like structures, which were irregularly shaped and are a couple of microns (millionths of a metre) across. The group observed that these ‘microplates’ had overlapping edges, and under stretching or straining, these microplates could slide over one another. To describe what they saw, the team coined the term ‘micro-tectonics’. When the surface was stretched the microplates pulled apart slightly, and when the strain was removed, the microplates slid back over each other to return to their original position. Repeated straining did not cause any undue damage to the surface. The overall motion of the microplates was thought to be caused by overlapped sections of oxide sliding over each other, which returned to their relaxed position after stretching. Dr Bhaskaran believes that the ability of these microplates to slide over each other whilst still maintaining contact ensures that the electrical conductivity of the surface does not significantly change. Only when placed under a high degree of strain do the microplates move far enough apart to cause a break in the conductivity. The implication of micro-tectonics is that they may perform well under strain, which is likely to occur when these electronic devices are placed on the body. After developing their innovative production technique, the group went on to think of new ways they could use their thin stretchable electronic devices. ‘This technological breakthrough has proven to be a very versatile solution allowing for the realisation of various applications,’ says Dr Bhaskaran. For example, they have used their technique to create devices that can detect dangerous gases and harmful ultraviolet radiation. ‘Many of these uses are of particular relevance to Australia and can be envisioned in applications such as detecting dangerous gases in mines or reducing skin cancer with widespread use of UV sensors,’ Dr Bhaskaran explains. She goes on to tell us that all of her team’s devices are ‘as thin as a nicotine patch’. In one particular project, the team focused on sensing the toxic gases hydrogen and nitrogen dioxide, both of which are hazardous to humans and found in many industrial applications. At low concentrations, they are colourless and odourless, which makes them hard to detect. When they are absorbed onto the ZnO surface, these two gases cause different effects. Hydrogen is a ‘reducing gas’, which means that it injects electrons into the ZnO surface, making the material more conductive and decreasing its electrical resistance. On the other hand, nitrogen dioxide is an ‘oxidising gas’ and it removes electrons from the ZnO surface, causing the conductivity to decrease and therefore the electrical resistance to increase. This means that changes in the electric current passed through the device can be measured and used to detect these gases. Another novel application explored by the research group is the development of materials for smart contact lenses. Instead of using ZnO or ITO, the team embed a layer of titanium dioxide (TiO2) nano-crystals into their PDMS substrate to create a material that is capable of manipulating light. 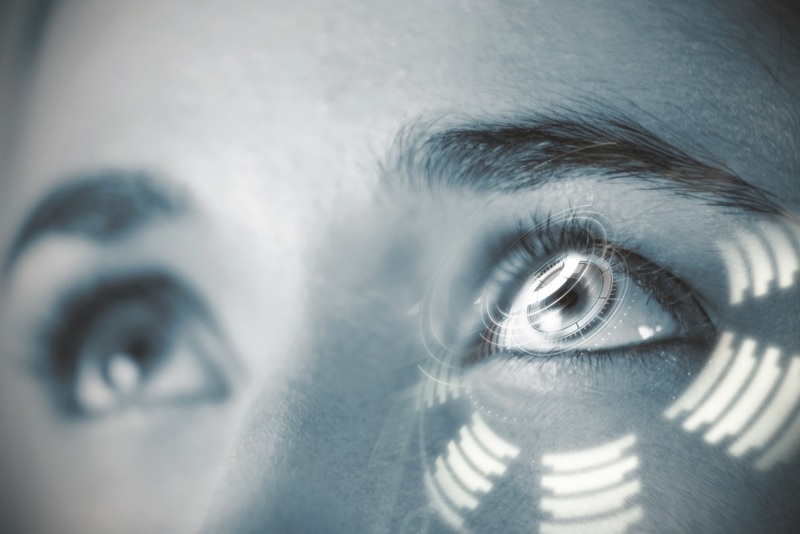 High-tech contact lenses created from this material could potentially be used to filter out harmful radiation, transmit data, collect vital information or even display information to the wearer. However, the team’s new material isn’t just restricted to smart contact lenses. Because of its ability to bend and manipulate light, it can be used to create flat optical devices that can replace bulky curved lenses, such as those found in cameras or telescopes. ‘Optical “metasurfaces” seek to revolutionise the realisation of optical components, where with the creation of nano-patterns of specific sizes and variation, one can engineer optical behaviour on a flat surface,’ explains Dr Bhaskaran. Stretchable electronic devices are rapidly evolving and may be used in numerous applications in electronics, energy harvesting and healthcare. The development of new functional materials will revolutionise the field of stretchable electronics, as they can make wearable devices much lighter, and less expensive. Dr Madhu Bhaskaran and her group have developed a novel method for producing thin, transparent and stretchable electronic devices using zinc oxide and other metal oxides. Many of the devices created using their technique outperform their rigid counterparts, opening the door for many new applications in medical and industrial devices. 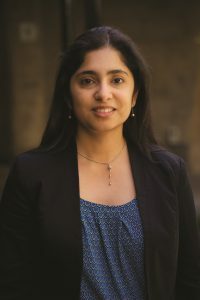 Dr Madhu Bhaskaran is an Associate Professor and co-leader of the Functional Materials and Microsystems Research Group. She was awarded her PhD in electronic materials engineering from RMIT University, Melbourne in 2009. Dr Bhaskaran has received prestigious awards, including Australian Museum Eureka Prize for Outstanding Early Career Researcher, MIT Technology Review Most Innovative Engineers in Asia Pacific and Engineers Australia’s Most Innovative Engineers, and has received significant funding of over $4,000,000 from the Australian Research Council. She has published a wide range of publications in high quality journals and book chapters and has presented her work numerous times at national and international conferences. Her research has resulted in 4 patents being filed in both Australia and the United States. P Gutruf, C Shah, S Walia, H Nili, A Zoolfakar, C Karnutsch, K Kalantar-zadeh, S Sriram, M Bhaskaran, Transparent functional oxide stretchable electronics: micro-tectonics enabled high strain electrodes, Nature Publishing Group Asia Materials, 2013, 5, e62. P Gutruf, E Zeller, S Walia, H Nili, S Sriram, M Bhaskaran, Stretchable and tunable microtectonic ZnO based sensors and photonics, Small, 2015, 11, 4532–4539. P Gutruf, C Zou, W Withayachumnankul, M Bhaskaran, S Sriram, C Fumeaux, Mechanically tunable dielectric resonator metasurfaces at visible frequencies, ACS Nano, 2016, 10, 133–141.